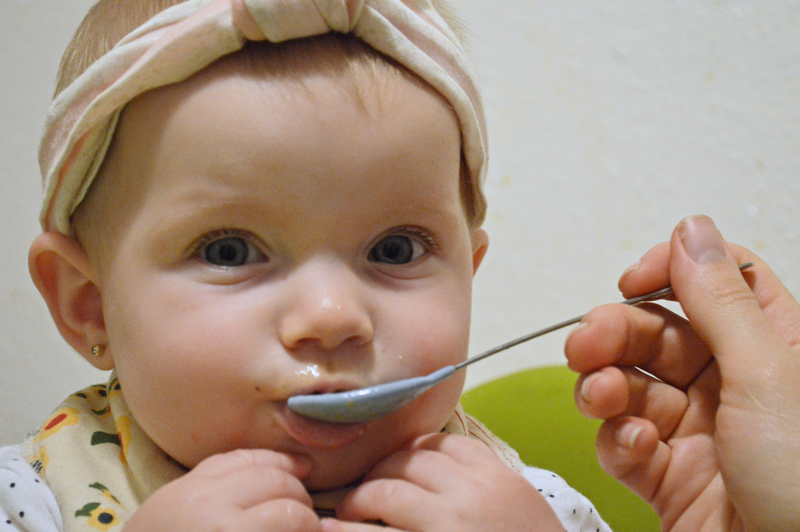 I’d like to begin by clarifying that there is no absolute textbook way that starting solids must be done. Sure, I have my thoughts on a good way to do it and so do many other moms, medical professionals, nutritionists, authors, the guy on the street that told me strawberries contain too much sugar, etc etc etc! Some of our thoughts jive, while others… not so much. Truth be told, unless you feed your baby arsenic, give them food they are highly allergic to, or they ingest something rancid, any food will “work” and the child will, by many accounts, “turn out fine.” I’m not here to debate that; children can certainly survive off of foods that our family avoids. We now know that many autoimmune diseases, sunburn, bone health, even crooked teeth, autism, ADHD, and a myriad of other ailments can be influenced by the things we put into our mouths. We aren’t just talking obesity or diabetes anymore. If there are ways for me to lessen the risks of these conditions for my children through nutrition, then I want on board! I want my children to thrive; to glean from the riches that nature & whole foods can offer them; to experience vitality. Right away you will notice that we have specific views on when solids should be introduced and reasons for delaying the introduction of grains/gluten. We have also decided as a family to use the appearance of certain teeth as signs of digestive readiness, and have based our timeline and structure off of that rather than an age-specific list. Just as babies learn to sit, crawl, walk, talk or use the potty at different times, I believe their digestive enzymes & abilities develop at different times. Teeth work in synergy with other parts of the body & can be a clue to these developmental stages. A major goal, no matter what stage we are in, is to provide real foods that are as minimally processed, chemical free, and refined sugar-free as possible. (Pictured: Darla’s first food at 7 1/2 months, homemade Bone Broth. YES, it was spoon-fed the first couple of tastes. Bone Broth (contains collagen & amino acids that help seal “leaky gut” that babies are born with), pastured egg yolks (provide cholesterol & omega-3 long-chain fatty acids found in breast milk, both which help with development of the brain), avocado, coconut oil (rich in medium chain fatty acids & Lauric acid, just like breast milk), and grass-fed butter. STARCHES: Generally, starches are something we hold off on due to low production of digestive enzymes at this age, but we give bananas and sweet potatoes since they contain high levels of naturally occurring amylase, the digestive enzyme needed, which makes them easy for a young gut to handle. PROTEIN: We like to offer organic/grass-fed meats, fish, & natural nut butters (with no sugar/salt/oils added). Some people prefer to wait until the 1 year mark for potential allergens such as fish & nuts, but we feel comfortable introducing them at a younger age and monitoring for signs of allergies. These “bulky” foods can make for bulkier stools though, so we make sure to introduce them slowly and pair with easy-to-digest produce from stage 1. PRODUCE: At this point all fruits & vegetables are incorporated, including gassy culprits like broccoli & onions. We also begin to introduce citrus, like oranges or grapefruit, again, watching for signs of irritation. STARCHES: Toward the end of this stage we begin serving traditionally prepared (soaked) legumes like lentils and peas. Properly pre-soaking them (12-24 hrs in appropriate solution) can help to reduce Phytic acid & lectins found within that block nutrient absorption. GRAINS: We add in modest amounts of traditionally prepared (soaked/fermented) quinoa, oats, & brown rice. We remain picky about the type and frequency of grains we offer due to glycemic index, nutrition-blockers, and other factors. SWEETENERS: At this time we begin to allow raw honey or stevia on occasion and in very low amounts. DAIRY: The plan is to give our kids primarily breast milk until at least two years of age (though we would technically allow other milks from the age of 1). We haven’t quite figured out the specifics of how & when to wean since neither of our girls have reached that age yet, but we would like to eventually add in goats milk, raw cows milk, and/or coconut milk. Pretty much everything else: At this point, kids inevitably start to eat like anyone else in the family. Their growth will slow down some and they will begin showing more specific tastes and interests in certain foods. The goal then becomes about raising healthy eaters rather than just dishing up healthy options on their plate. Maybe your family has a similar plan to ours, or perhaps it is completely different! Sometimes responsible parenting is identified by our conclusions, but I believe true responsible parenting is defined by how we get there; by taking the time to think it through and making the best possible choices we can for the individual children we have each been blessed with. 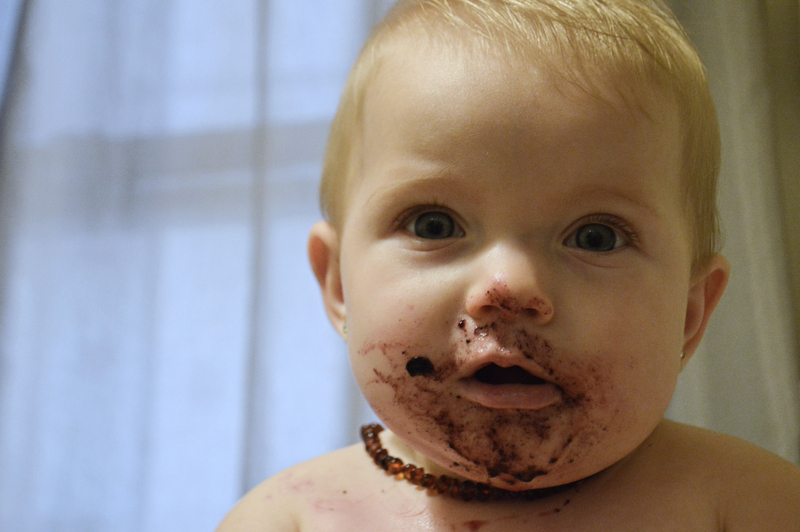 This post is part of our Baby Food series. Love this. We do almost exactly the same schedule. Except we hold off on citrus till 1 year (and later for my citrus sensitive kids) and we introduce dairy (milk, coconut milk, etc) at 1 year. We don’t fully switch to milk at 1 year but they could have it at 1 year (hope that makes sense). What a handy reference! We follow something similar with our nine month old. She got her first teeth at three months though (!!) and I still waiting until 6/7 months to give her food. Wow, so early! I’ve heard of a few babies being born with teeth too. In that case it’s good to also look for other “prerequisites” too! 🙂 happy feeding! Hi, just stumbled upon your page! I love the alternate sources of iron, since that seems to be a main reason everyone likes to start off with rice cereal. I was wondering what your thoughts are on brown rice infant cereal? I’ve been doing research and am having trouble finding an organic one with “acceptable” levels of arsenic. (Inorganic from previous crops of cotton years ago, it apparently stays in the ground a LONG time and is water soluble), if there is such a thing! So, I’ve not been excited about that. I really like the way you have presented this article. I am a first time mother of my baby girl who is 6.5 months. She hasn’t got her first teeth yet so we are waiting to start solids. But people around me including nurses doctors keep asking why I am waiting. Reading your articles gives me some relief and hope that I am not alone. 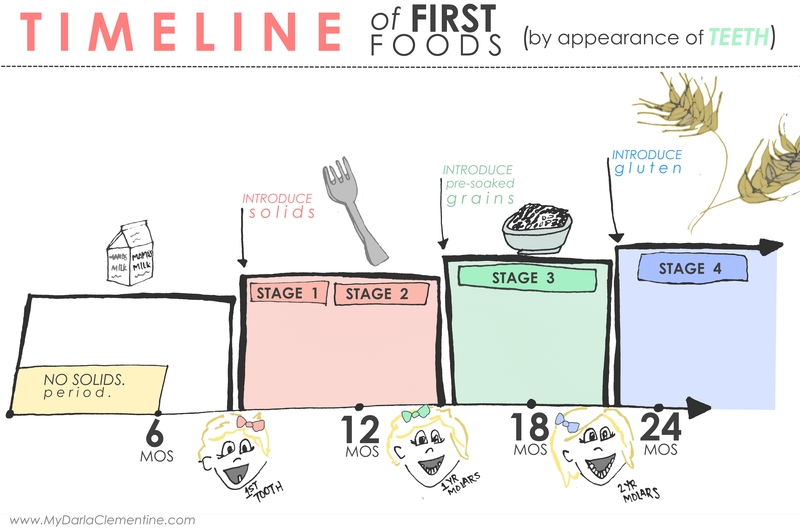 I want to follow a similar schedule once my baby gets her teeth and follow Baby led weaning. That’s great, Poornima! Enjoy your precious little one 🙂 You are definitely not alone!! Hi there! I am looking for a study explaining the link between the apparition of teeth and the ability to digest certain foods, do you recommend a particular source ? Thanks !